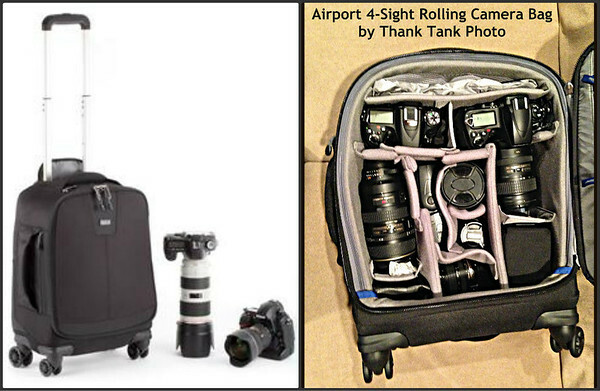 After looking at dozens and dozens of bags and reading just as many reviews from fellow photographers, I decided to stick with Think Tank Photo and found their Airport 4-Sight Rolling Camera Bag fit my criteria to a tee. Once filled, the bag moved freely on all four wheels on hard floors and easy to pull with two wheels on carpets. The bag meets all International and US carry-on bag restrictions. With handles on the top, bottom and side, it was easy to lift over my head fully loaded safely. I am anticipating worry free and physical ease in transporting my camera gear during my travels. This entry was posted in Photography, Travel and tagged airport 4-sight, bag, camera, lens, rolling, think tank photo. Bookmark the permalink. Think Tank bags are my favorites. There is only one other pack that I like just as much and that’s the Lowepro Flipside 500 AW because I can fit a Canon 500mm prime into it and the hip belt is wider, better padded, and fits my frame. When not lugging around a supertelephoto, though, the Think Tank Airport series bags are my go-to bags. I can see why you would go with a different bag for a big telephoto lens. Someday, I hope to have the problem! Great bag and amazing organization inside 😉 I am looking forward to seeing your pictures once you take your photo gear our of this Think Tank bag ! Have a wonderful trip Scott ! I shall, Isa! Being organized like this will help a great deal in being able to grab the right gear at the right time.